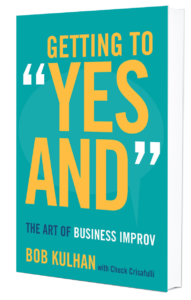 Learn the art of business improv with my new book "Getting to 'Yes And'"! - Getting to "Yes And"
Learn the art of business improv with my new book “Getting to ‘Yes And'”! For more than three years, I’ve dedicated incredible amounts of time and energy writing on Getting to Yes And: The Art of Business Improv (Stanford University Press). Thank you for your inspiration in this journey! GTYA was a project based in passion and love, and after countless hours of hard work, I’m so excited to announce that the book is officially available today! Getting to Yes And is the definitive guide to business improv. I teach readers to think on their feet and approach the most typical business challenges with fresh eyes and openness. I show how improv techniques such as the “Yes, and” approach, divergent and convergent thinking, and focusing on being present can translate into more productive meetings, swifter decisions, stronger collaboration, positive conflict resolution, mindfulness, and more. Getting To Yes And was created to help everyone improve their business performance and everyday life. As a prescriptive book, it moves past general philosophy and delves into the “how” improv techniques can be easily and thoughtfully applied to various real-world settings. I am sure you have at least one friend or family member who would benefit from reading Getting To Yes And, so please spread the word by sharing the news. Thank you very much for your support! Enjoy the reading!